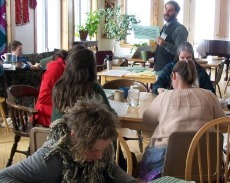 Participants in a whole farm planning class in Hartland, Vt., 2011. No matter what stage your farm business is in, UVM Extension offers classes to help you reach your full potential. Following are courses offered by the New Farmer Project and other UVM Extension programs that are specifically designed to meet the needs of aspiring and beginning farmers. Check our Calendar for a regional list of events— from field days and workshops to classes and webinars— that may be of interest but do not necessarily specifically target beginning farmers. Not sure which one is the right class for you? Click on the links for each class to learn more about content, dates, times and locations. Or, use the Fall & Winter Class Schedule PDF for an "at-a-glance" comparison of our offerings. Upcoming sessions: October 2011 and Jan. 2012. Get your enterprise off to the right start. Participants define goals, explore and evaluate opportunities and resources, and become familiar with state and federal agriculture programs. Offered online and in person. Co-sponsored by the Women's Agricultural Network. More Growing Places course information and registration materials. For all farmers interested in farm financial basics. Learn the basics of budgeting and skills to anticipate the financial needs of your operation. Participants will complete balance sheets, income statements and cash flow statements. More course information and registration materials. The Building a Sustainable Business course guides participants through developing a business plan for farm businesses. Most useful for people who have completed Growing Places and/or who have at least one year of production/financial records of their own. More Building a Sustainable Business course information and registration materials. For people with five or more years in business. Taking Stock addresses issues that tend to arise in businesses that have been up and running for awhile and could benefit from a progress check. More Taking Stock course information. Upcoming sessions: Starting January 2012. Join other farming women for support and camaraderie learning about whole farm planning. Topics for this 10-session course include: Creating a Values-based Farm Mission; Whole Farm Decision Analysis Process; Increasing Farm Profitability (Gross Profit Analysis; Enterprise Analysis), Business Planning, Marketing, Soil Fertility, Time Management, Land and Infrastructure Planning, Leadership and Communication Skills, and Integrating Livestock on the Farm. Participants also work with a mentor throughout the course period. Limited to 15 participants chosen through an application process. More Whole Farm Planning for Women Farmers course information.